Review: Set in the year of 2045, there is an immersive virtual world where you can go anywhere, do anything, be anyone. The only limits are your own imagination plus this is a place where people can escape their harsh reality. The virtual world is called the OASIS. When the creator dies, he releases a video which challenges all the users to find his Easter Egg. Wade Watts, an unlikely hero, conquers the first challenge of a reality-bending treasure hunt. After the Easter Egg is found the finder will have all of the fortune. It is up to him and his friends (High Five), who go on an adventure of discovery and danger, to save the OASIS and also their world. 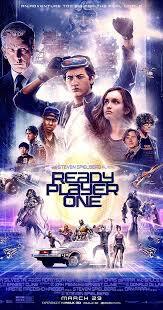 This film is based on a book by American author Ernest Cline. How Steven Spielberg has managed to direct this film from a novel like this I will never know. No director could ever have done such an amazing job. In an interview Steven Spielberg said that this was his third most difficult movie he had made. The other two were Jaws, 1975 and Saving Private Ryan, 1998. At the start of production Christopher Nolan, Matthew Vaughn, Peter Jackson and Edgar Wright were all considered to direct this film. I really enjoyed seeing Mark Rylance and in my opinion he keeps going from strength to strength in his films. This is Mark Rylance’s and Steven Spielberg’s third collaboration together. The first being Bridge of Spies, 2015 and then The BFG, 2016. I felt that I engaged with all the characters and was with them on this journey. I also thought that the OASIS world and their own world worked really well. It wasn’t at all cliched. I have to say that if you have not seen the film The Shining, 1980 then there will be a lot in the film that you won’t understand or get. Another film it also makes several references to is Saturday Night Fever, 1977. Just half an hour into the film it also made references to Silent Running, 1972. It has a great soundtrack throughout the film. I think it is great that the film has been released during the Easter Weekend as the film involves finding “Easter Eggs”. Even though this was 2 hours and 20 mins, as with all of Steven Spielberg’s films, I was surprised at how quickly it finished and also how quickly each scene went. You can’t tell when watching this but I am very proud to say that most of the film was filmed at the Jewellery Quarter, Gravelly Hill and Digbeth in Birmingham, U.K.